Combining one-liners, observational comedy and the occasional song, John's routine lends itself to a wide range of clubs and audiences. John is a sure fire hit with any crowd. 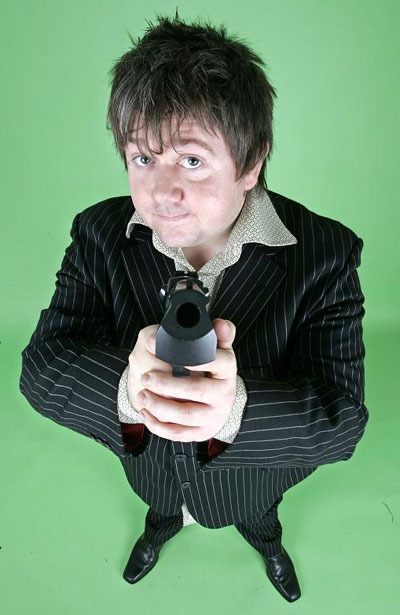 John has headlined comedy shows from Doncaster to Dubai, and at lots of places in-between. A regular at all the big weekend clubs around the UK, he is also available for corporate events. Recently seen on Coronation Street, as Barry Sidwell, John makes his big screen debut in 2009 alongside Robert Carlyle, in big budget action thriller The Tournament. Before turning to comedy John was a tabloid journalist, although he says he wasn’t very good at it. Which is a shame because he did it for bloody ages. These days when John’s not performing comedy he writes it, with credits across network TV and radio. If you need something funny writing – John is your man. “Warburton is much in demand at the moment. His set bursts with clever wordplay and smart-Alec asides.” - – TIME OUT, *****. "Rock'n'roll and very, very funny," - – loaded, 9/10. "After using John Warburon for our event we received the best feedback we have ever had. He made the night for all involved. He was superb and incredibly funny." - John Knight, SMG Europe. "John really hit the mark with his set at our Company Forum, everyone really enjoyed it, highly recommended" - Alison Spacey, Yes Telecom. “His material very suitable. The singing and the guitar was very funny and original. Audience loved him. Recommended” – Helen Rangley, Newsco Insider.